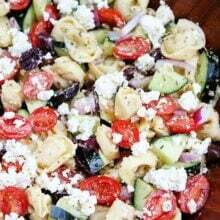 Greek Tortellini salad made with cheese tortellini, tomatoes, cucumbers, olives, red onion, feta cheese, and simple Greek dressing. 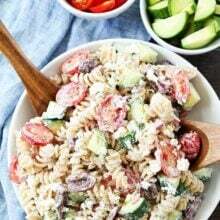 This easy pasta salad is perfect for summer potlucks and barbecues. June is here and that means summer is here. I know summer doesn’t officially start until later in the month, but I am ready! I am giving us all permission to start summer early. We kicked off our early summer by making a Greek Tortellini Salad for dinner. I love making pasta salads during the summer months and this one is already a favorite! I love a good classic Greek Salad, but I also like to mix things up. Last year, I made a Greek Quinoa Salad and it has become a staple in our house. This year, I jazzed the traditional Greek Salad up by adding cheese tortellini to the mix. Josh loves cheese tortellini and was very happy my new salad creation. Cheese tortellini-you can use refrigerated, frozen, or even dried tortellini. Refrigerated or frozen tortellini is our favorite to use. Grape tomatoes-you can use cherry tomatoes too. Cucumbers-seedless cucumbers or regular cucumbers work well, use your favorite! Kalamata olives-make sure you buy pitted kalamata olives. Red onion-thinly slice the red onion. Feta cheese-you can buy a block of feta cheese and crumble it into the salad or buy pre-crumbled feta cheese. Greek dressing-this dressing is easy to whisk up and gives the salad great flavor. I love making tortellini pasta salads because they are filling and easy to make. Cook the tortellini, according to package instructions, and add in tomatoes, cucumbers, kalamata olives, red onion, and feta cheese. Toss the salad with the simple Greek dressing made of olive oil, red wine vinegar, garlic, and oregano. You can serve the pasta salad right away or chilled. This salad can be made ahead of time, which is a huge bonus. It will keep in the fridge for 2 to 3 days. I love making a big Greek Tortellini Salad so we can nibble on it for a few days. This pasta salad is always a hit at parties and potlucks. Everyone will beg you for the recipe! 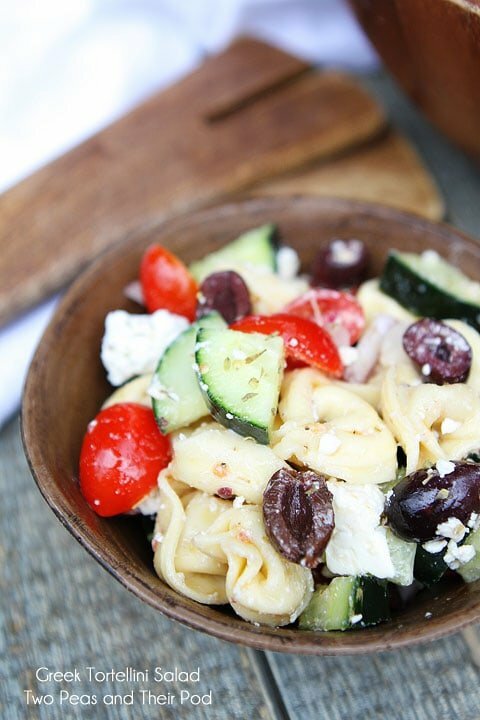 Celebrate summer with this Greek Tortellini Salad! It is a great salad to take to summer barbecues, pool parties, and picnics. No need to wait, let’s get this summer party started! 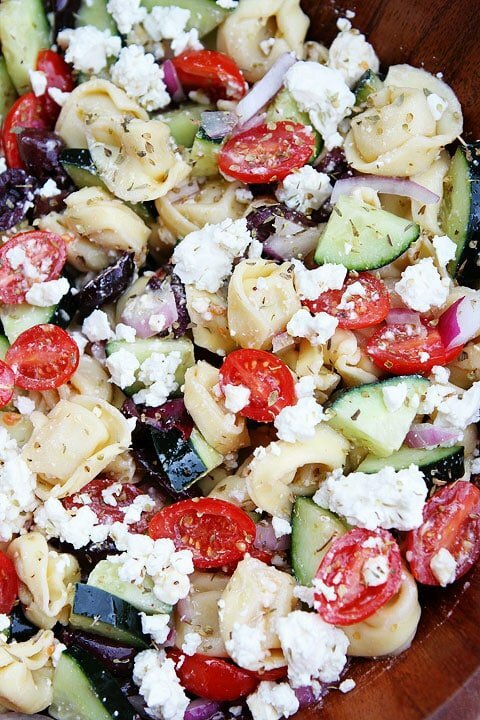 The classic Greek Salad gets an update by adding cheese tortellini. This salad is great for picnics, parties, potlucks, and every day meals! Bring a large pot of salted water to a boil. Cook the tortellini according to the package directions. Drain the tortellini and rinse with cold water. Place the tortellini in a large bowl. Add the tomatoes, cucumber, olives, red onion, and feta cheese. In a small bowl, whisk together the olive oil, vinegar, garlic, oregano, salt, and pepper. Pour the dressing over the salad and stir until salad is well coated. Serve immediately or place in the refrigerator. Note-this salad will keep in the fridge for up to 3 days. I just made a salad like this a couple of weeks ago! Oh my gosh it’s amazing flavors. Love that you used cheese tortellini’s! Beautiful salad! Mmmm! I’m with ya, tortellini are so very, very good! 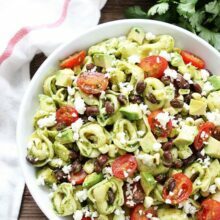 🙂 Thanks so much for linking to my Spring Pesto Tortellini salad…and for the new recipe to try! Hope to meet you this weekend in Austin! Such a beautiful salad; need to try this, Maria! This looks super refreshing and perfect for a hot summer day! Mmm so great for a picnic! This looks lovely. So beautiful and I love greek flavors! Perfect for summer! This is totally my kind of pasta salad! Looks great! I love Greek anything and this salad is no exception! The colors are gorgeous and the flavors are lovely! My littlies love tortellini too, and I was just thinking that it was time to start up the summer salads. I love keeping a stash of salads in the fridge for quick summertime meals. What a delight to find this waiting for me in my inbox this morning! Summer in a bowl.. I love it! Oh yum! This has all the ingredients that I just love together. So pretty, too! I love these flavors- they are some of my favorite! Looks great Maria! That looks so perfect right now! Light and summery yet full of flavor 🙂 Well done! Being part Greek, Greek salads are near and dear to my heart. I’m always looking for new ways to prepare it, and this is definitely one that I would love! Loving all of these flavors together! I need a mega fork for it! This is my kinda salad! All those beautiful colors!!! My kind of tortellini! Yum!! 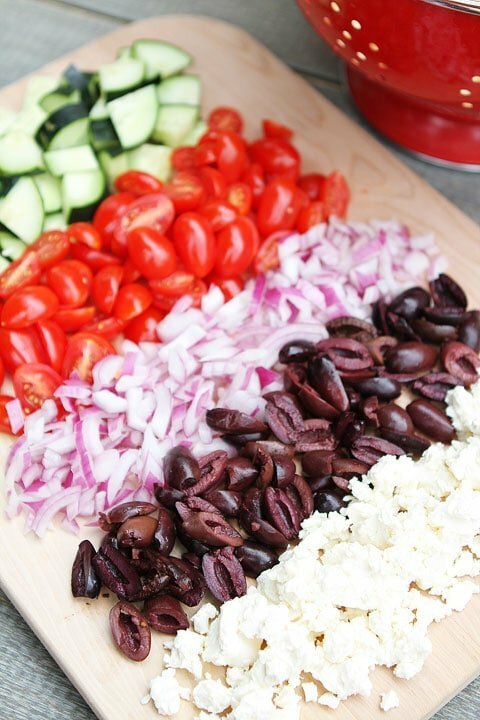 I love Greek salad, this is perfect for summer picnics! Such a fabulous idea! This would be a perfect side dish or main dish on weeknights with grilled meat! I can testify that this a winner! Yummy, Maria! And I agree, let’s start summer NOW! 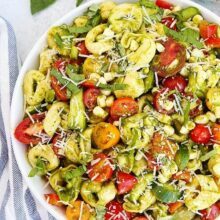 Adding tortellini is one of my favorite ways to spruce up a pasta salad! Makes it that much more fun. My hubs would go crazy over this! I can’t wait to make a big bowl of this when he returns home! I’m with you, so ready for summer to start!! And this is a perfect kickoff!! Perfect timing! I have a potluck dinner tonight and then a potluck lunch at work tomorrow. Thank you! I have two packages of tri-color tortellini & I’ve been looking for the perfect recipe. Found it. This looks great! I can’t wait to try it. That salad looks so refreshing and light. I have got to make that ASAP. On a side note, your photos are always so beautiful. I looooooove cheese tortellini AND Greek salad, so this is juts made for me! Light and refreshing. Love it! A simple and very perfect meal! Hi Maria…this looks great and I want to make it for a work event…I don’t have red wine vinegar and storage space is an issue…do you think white balsamic can be subbed? Thanks! You can use balsamic if that is all you have. Enjoy! My GREEK brother in law couldn’t stop eating this. Authentic or not, it’s crazy yummy. Keep the wonderful summer salads coming and thank you! This was terrific!!! Threw some grilled chicken strips on top for my protein loading husband, but I loved it as is! Thank you!! Very nice. I made this today with a few variations, not better, just different based on my tastes. I used 1/2 lb. of orzo, as I like it better than those store-bought cheese-filled tortellinis. I also pureed the garlic clove rather than minced, tossed in a few leaves of shredded basil (could have used fresh mint but my wife doesn’t like it), and added a bit more vinegar to the dressing, as I love the vinegary taste of a Greek salad. You gave me an excellent palette to work with however and I thank you. Very imaginative idea. Just made this for a party that we are having tomorrow. Oh my word! I’m trying to keep myself from eating it up. It’s so delicious!! Made this for our 4th of July BBQ, except I doubled the recipe. It was sooo good! It went pretty fast. Will definately make again! Quick follow-up to my post re the variation I tried, after I ate it. Doing it again I would use 1/4 lb. of orzo (about half a cup), as you will want to feature the Greek Salad, not making it too much of a pasta dish. Still, it was quite good. Thanks again. Made this tonight – used whole wheat tortellini. Loved it! Thanks very much, Karen!! Will try this for sure! Hi! So I just realized I picked up ravioli instead of tortiliini because I couldn’t find it (as I’m making it, I now remember where it is). Will that work?! Please let me know. Sigh. Go figure!!! Sure, you can use ravioli! Enjoy! THANK YOU!!!!! This turned out amazing!!!! I will be making it again. Mmm. Looks so good . I can’t wait to try it. I’d better hurry up while the tomatoes are still nice here in New Jersey. Thanks for the pin! Made this tonight and it was SO good! Refreshing and light and the dressing was simple and full of flavor. I will be making this more often! Greek Salad is my favorite. I can see how adding the totellini would make it over the top. Makes my mouth water and this is a recipe I will make. Looks so yummy, but at the same time has tons of healthy ingredients. Thanks for sharing. Delicious salad! Served olives on the side because of a couple of finicky eaters. Just as good a day later! I made this today for a late lunch, it was fantastic!! This salad was awesome!!! I left out the Feta cause I can’t stand it, and added a can of artichoke hearts (quartered) and it was to die for!!! I used to make plain greek salad, not anymore! The tortellini make it very filling and satisfying while the dressing kicks it up BIG TIME! I will be making this for lunch regularly. I did not have a cucumber, replaced it with a few leaves of romaine. Hi! I made this today…YUM! I blogged about it at fourmilesnorthofnowhere.blogspot.com and at whatscookin4milesnorthofnowhere.blogspot.com and I linked back to your site/recipe in both places. If you have any objection, let me know and I will take down posts. Thanks for this recipe. LOVE it! Tried this yesterday. It was delicious. I am making extra oil to have on hand. Does this have to stay refrigerated? OH EM GEE, this is sooo Delish!! I just made it and took a few bites and am LOVING IT!!! thanks so much for sharing!!!!! Leave the raw red onions out of it and you’ve got something good. I hope this woman asked for your permission to duplicate this recipe on her site! I did a review of this on my blog, I didn’t post the recipe and gave you totally full and WELL DESERVED credit! I linked everyone here for the recipe! This was amazing, and I did add one thing (not that it needed anything) Garbanzo Beans! It added a little extra! 🙂 Thank you soo much for this delish pasta salad! This salad is delicious, love the tortellini in it!! Served with grilled chicken, perfect Summer meal. Thanks for sharing! Made this today for a BBQ. I added an additional tbsp of red wine vinegar for extra tartness, a tbsp of dried dill for a bit of brightness, and artichoke hearts cause it’s not greek without them. Everyone LOVED it and we came home with no left overs! I made this for a party last night and doubled the recipe. I added romaine lettuce and used a high quality Balsamic dressing. It was fabulous ! Big hit at the party too. Thanks for the recipe ,this will be my go to salad ! 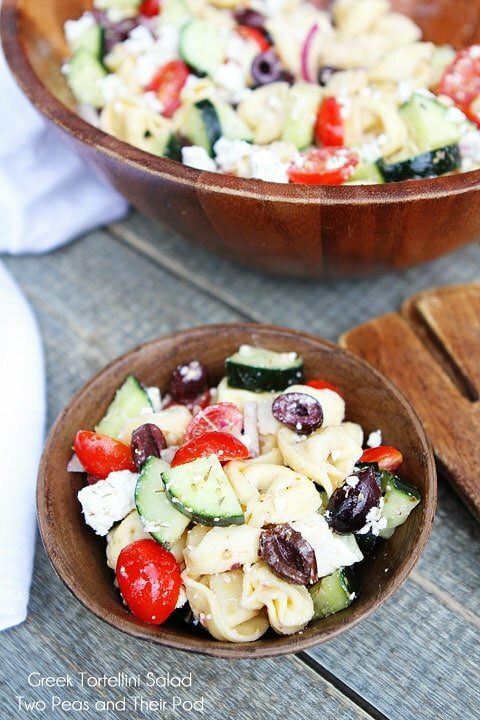 Pingback: Greek Tortellini Salad Recipe on This salad is always… | bingoa ! A huge hit! Beside exempting the red onion and substituting a smidge of grated white onion and a pinch of sugar in the dressing I made no changes. It was so delicious my husband demolished it for dinner last night and requested it again today. Thanks for sharing! Love this!! thank you for the recipe. This recipe is a staple for potlucks, my husbands coworkers always ask him to have me make it for functions. I usually add some pepperoni and pickled artichoke hearts. absolutely delicious!! This was delicious! Took to a cookout and everyone was raving about it. Thanks! Loved this recipe! Oven roasted my tomatoes and added some orange and yellow roasted peppers. No need for any dressing! I just made this for lunch today, and I love it! I was wondering if anyone knows how many calories are in this thing? I have been keeping track with my Fitbit. I’m no fan of cucumber or raw tomato (except as an unrecognizable element in sandwiches). However, I’ve been really wanting to eat healthier lately, and I want to develop at least a like for these fruits. Then, on Saturday, I was gifted with a quantity of little bitty tomatoes, leaving me scrambling to find some way to use them before they went bad. So I made this yesterday. Holy bananas. It’s so good! So addictive! I could eat it until I exploded. The variety of textures is outstanding! My roommate, who hates olives and also dislikes cucumber, can’t get enough of this, either! The only down side is that making this really showcased how ill-equipped my kitchen is. The biggest bowl we have could barely contain all of the salad, making it extremely difficult to stir. this is absolutely perfect! One of our favorite “make again” dishes. I freaking love this stuff. I make it for every potluck or party I go to. The only issue I have with it is that it’s too difficult to not eat all of it before it gets to the car! I usually have excellent self control but there’s just something magical about this recipe. I could eat the whole thing in one day. I would give it 20 stars. Have made this for yrs. I use Bernstein caesar dressing. Keeps great is actually better on second day. I just made this for an early Memorial Day picnic and oh my goodness is it delicious! I had to make myself stop eating it and put it in the fridge lol. I know everyone is going to love it. Great recipe, it is SO good!! So glad you liked the salad! Do you know the nutritional value or ww points for this per serving? I just found this salad recipe last weekend, and have a potluck for 70 tomorrow. Just made the salad (doubled!!) and it’s a good thing because I can’t stop ‘sampling’ it. Yum!! I salted the water the pasta was cooked in, and it didn’t need any more in the salad. I did leave out the red onions – the cucumber added enough crunch for me, and I don’t care for onions. I will be inflicting this on my extended family 😀 Thank you for the recipe! I made this today and oh my goodness it’s so good! Light and refreshing, perfect for today since it 97 degrees outside! I didn’t have Kalamata olives so I used the green olives I had on hand and it was great. Any kind of olive is good! Do you by chance have any nutritional information on this? It tastes so yummy I can’t believe it will fit into my low cal diet plan lol. I don’t know the nutritional info, sorry! I am glad you liked it! This are delicious dishes, thank you for your help in mimimaze the dayling cooking!! May the Lord bless you! So good to be true!! Making for a picnic tomorrow. My daughter made the Greek Tortellini salad for our Labor Day gathering and it was absolutely fabulous! We never thought of using tortellini in a salad and it was refreshing. This salad can stand on its own as an entree! So good! One of my favorite meals. Not into cold pasta salads. Looks good, but to many different flavors. Io sono di bologna (italia) e questo è un insulto alla mia terra…. Good! I like it! Thank you! Look delicious! Great! Like and share! I don’t have any tomatoes that aren’t canned. Any ideas on a substitute? My favorite party or potluck food to make! And I always make enough to be sure I have leftovers! So good!!! My new “go-to” pasta salad!! So yummy. I Added a jar of artichokes and 2 sliced avocados. I have also used Gazebo light Greek Dressing when in a pinch. So very good! Add a toasted pita pocket and tah-dah!! I’ve made this many times to great reviews. Also served at a friend’s baby shower, it doubles and triples well! This is a go to for me. I’ve never made pasta salad before using tortellini…but looks delicious! Love this Greek spin on a bbq staple! Tried this recipe for a “salad contest” at work – I won 3rd place! Great flavor, thanks for the recipe! This recipe was absolutely fabulous! It was amazing simple and quick to make too. The taste was just fantastic! Yay! Glad it was a hit! Definitely making this again. Everyone raves for it. I love this dish! I’ve made it many times for family gatherings and parties with friends. It’s a hit every time! The Greek tortellini salad was delicious! This looks likes it has a lot of great flavor. I added fresh Italian parsley and a few drops of lemon juice to liven it up a bit. Good! 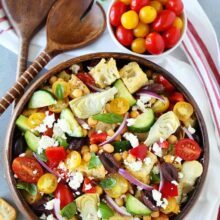 Would it be ok to make this Greek tortwllini salad the night before or would you suggest making it the day I will serve it? This salad is so easy to make and is like my daughter said “so yummy” thank you for sharing. We love this recipe I made it as directed and will make it again. It was easy and delicious! That’s a winner in my book! Thanks for the great recipe. A friend brought this salad to my house and then directed me to this website. I’ve made it a few time for events and it is always a HUGE hit. It’s so fresh and easy to put together and is absolutely delicious. Very easy, light and healthy supper. I used pre-sliced kalamata olives and that reduced prep. We had some leftovers and refrigerated. The tomatoes lose all flavor after being refrigerated. Recommend using it all in one go. Anna: why, then, did you give it only one star?